This beautiful bird descends from a cross between the Eastern Wild Turkey and domestic turkeys brought to this country by European colonists. It is named for the Narragansett Bay of Rhode Island. They are a rare, multicolored, medium-sized breed with hens weighing up to 17 lbs. And toms up to 30 lbs. Their body plumage is primarily black with bands of steel gray. The tail is dull black, regularly penciled with parallel lines of tan, edged with steel gray. They are known for being calmer than most and are good mothers. As poults the Broad Breasted Bronze turkey's legs are thicker than those of the Standard Bronze or Narragansett. If you hold them facing you, their Broad Breasted Bronze, they have a more broad back than the others. 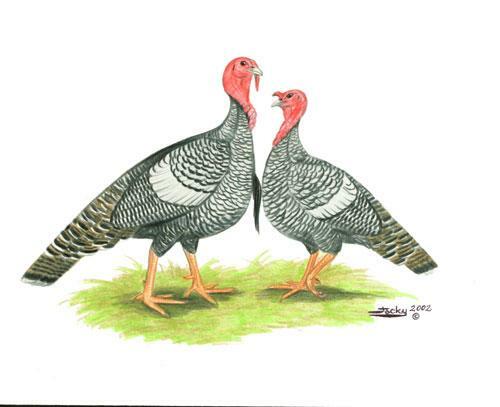 Will the NARRAGANSETT TURKEY sit on their eggs to hatching time? Narragansett turkeys are a calm breed and make good mothers. Broodiness can be variable; the best hens are those that are well balanced and not too heavy; hens that are larger than breed standard tend to be clumsy mothers and can break eggs. Narragansett turkeys reach maturity at 28 weeks of age. can i order a few turkeys with my order of baby chicks? Turkeys do not hatch at the same facility as baby chickens, so cannot be shipped together. We separate the species for disease control. Turkeys do not produce as well as chickens. They will lay between 50-100 eggs during their season. Love my active babies!I received my 16 (thanks for the free peanut!) turkey babies on August 12th from the post office! One baby was on the brink of dying but I nursed it back to health and now is a proud member of the flock...all babies are active and love attention from us! I know we're not out of the "woods" yet but at day 14, they are doing very well. I have had to teach them to eat their food in which I added water to make a mash. They seem to like to eat the feed better that way. I add raw honey and the electrolytes that I received with the birds to their water. This keeps them happy and healthy.... I'll be ordering more turkeys next year...thanks again! Everything was perfect15 poults arrived April 9. I have ordered poultry from several different places and these arrived in the best shape of any I have ever received. All were alert and well. I passed the critical stage and all are still alive and doing well. They are friendly, affectionate little critters, fun to watch and play with. I will definitely order from McMurray again.